I apologise again for the interruption to my regular weekly article Last Week on My Mac, which appeared then disappeared yesterday. I’m still not quite sure what happened, but I had mistakenly concluded that Apple had changed the behaviour of the secure shell, ssh, with respect to privacy protection. Despite several sessions looking carefully at this, even studying the logs of both client and server during ssh connections, I was completely wrong. For the avoidance of any doubt, Mojave 10.14.1 update hasn’t changed the behaviour of ssh with respect to privacy protection: if you enable Remote Login to your Mac in its Sharing pane, then anyone who gains access as a user using ssh can see all that user’s private data. Whether this is a bug or a feature, I’ll leave you to judge when I explain how this works. It is particularly interesting, as it is one of the rare exceptions to the rule that only user interaction can modify the lists in Privacy: here, TCC adds its own item to the Full Disk Access list without any user warning or consent. accessed and permission now stopped, with sshd-keygen-wrapper listed but not ticked. When you try to access that Mac using ssh, if it is in either of the first two states, macOS will automatically give ssh Full Disk Access. It is only when Privacy settings are in the last state that access to protected data will be refused. The only control that the user has is enabling and disabling the sshd-keygen-wrapper in the Full Disk Access list, which has the effect of toggling access to protected data for that user. Note that removing the sshd-keygen-wrapper item from the list sets it back to the first state, effectively enabling Full Disk Access: it does not prevent access to protected data at all. 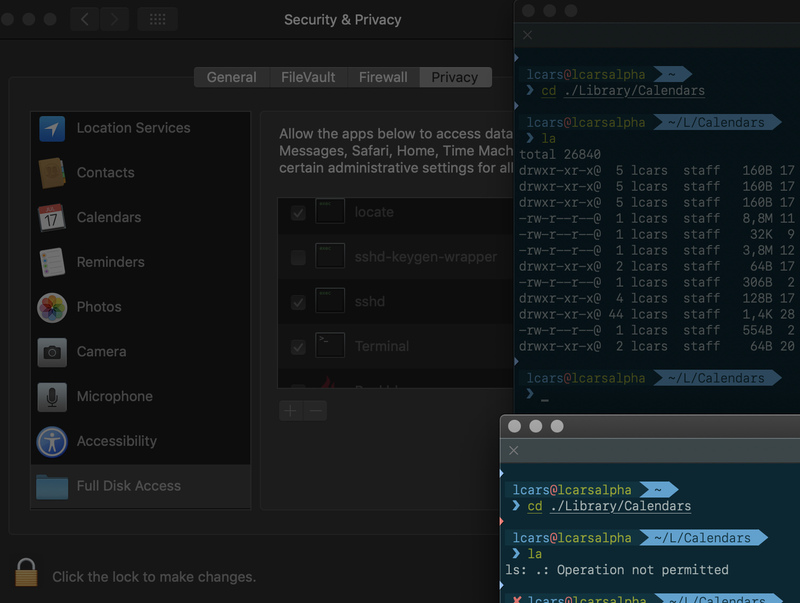 With an ssh connection to a Mac, asking to list or view the contents of items which are not protected by TCC takes place through opendirectoryd and supporting services, and doesn’t involve TCC at all. When you ask, for example to list the contents of the ~/Library/Calendars folder using ls, in the first instance a synchronous request is made to com.apple.tccd.system for the service kTCCServiceSystemPolicyAllFiles and function TCCAccessRequest. TCC constructs the attribution chain for this with the requester (REQ) as /usr/libexec/sandboxd, the access requested (ACC) as /bin/ls, and the responsible process (RESP) as /usr/sbin/sshd with a responsible path of /usr/libexec/sshd-keygen-wrapper. sshd-keygen-wrapper is a tiny bit of code which is inevitably undocumented, and concerned with generating keys for ssh. It has in the past acted as a proxy for ssh/sshd in configuring firewalls, and here it also seems to act as a proxy for sshd. and the result of the query with TCC is true – the access can go ahead, and sshd-keygen-wrapper is magically added to the Full Disk Access list by TCC. This illustrates how, using current mechanisms, third party apps cannot add themselves to the Full Disk Access list, even with a user’s consent: to do so here requires TCC to have it on its defaults list, to recognise it as static code of a particular type (and presumably protected by SIP), and for securityd to confirm that it is signed by Apple. The next time around, with sshd-keygen-wrapper in the Full Disk Access list, TCC authorises access direct from the allow list, which saves those couple of steps. In other words, this is a faceless command tool which would have required TCC to seek user consent. As that is not possible here, the request fails. for the responsible sshd-keygen-wrapper stub. The effect of removing sshd-keygen-wrapper from the Full Disk Access list is exactly the opposite of all other items in that list, in that (because of the default behaviour of ssh) it enables access rather than blocks it. This is the only part of privacy protection in which the default is to allow, without any user warning or interaction. Together these are inconsistent design which will lead to human error. the full supporting documentation for privacy protection in Mojave, which merits a manual of its own. Given the design issues noted above and the potential for user error, not to have drawn these to the attention of users and administrators is a serious omission. Posted in Macs, Technology and tagged macOS 10.14, Mojave, privacy, Remote Login, ssh, sshd, TCC. Bookmark the permalink. It works. Topmost is shell logged in via ssh with sshd-keygen-wrapper unticked (see pane), second shell is local with full disk access (iTerm in FDA & ticked). Question: sshd can remain ticked in the FDA list? As far as I can tell, adding ssh or sshd to the FDA list does nothing: it’s sshd-keygen-wrapper which controls access to the protected data. If you are ever going to use ssh into a Mac, you should be able to remove ssh and sshd from the FDA list, leaving just sshd-keygen-wrapper. When you want access to protected data, ensure that it’s ticked; when you don’t, simply untick it. But don’t remove it, as that will open up full access whether you want it or not. Thank you will. Will remove sshd. I don’t need full disk access via ssh (at least not at this time), so I’ll leave the wrapper unticked.